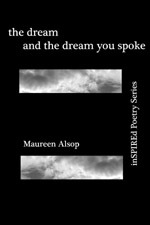 inSPIREd Poetry Series, Spire Press, Inc. The sophisticated use of enjambment serves many technical functions in these poems, not the least of which is illustrated in the second stanza quoted above. The line ending, “every teacup in the house grew,” leaves us feeling like Alice in Wonderland, only to reassure us in the next line that the teacups grew, not larger like our bewildered childhood heroine, but merely and mundanely “stained.” The fact that we are told that the “sea was not an accident” in a poem titled “Accidental Sea” makes us feel off-kilter from the beginning, and forces us to question what we think we know about our world. Unusual and richly alliterative word pairings, such as “strawberry sun” and “peacock plume,” in addition to such exotic word choices as “plumbago” and “saguaro,” essentially serve as the looking glass through which a farmer with mismatched eyes living in a mill town becomes a mystical figure surrounded by a luscious, succulent landscape. The setting once so familiar to the narrator morphs into a site of transforming vision. The final metaphor here strong-arms the reader into Alsop’s Wonderland, where sand blowing over rock is naturally assumed to be “not / alive, but animated.” In the same way that we are told “the sea was not an accident” in the poem titled “The Accidental Sea,” we are here told that the sand has life, but it is not alive: the imagery and language are so hypnotic, and the lines so lullingly musical, that we believe it. Such esoterica as augury and monasteries are, however, punctuated by the ordinary: the woman “drinks coffee from a dinted / thermos” and “gnats / flick at the eyes.” In this, as in the other poems in the collection, we are left with the understanding that Wonderland is not somewhere beyond our ordinary reality: it is our ordinary reality, simply seen through a different lens. four candles into a terracotta urn. a cotton blanket and a corner to lie in. Candles flutter. Innumerable stars break loose. pool of rain-water steaming into sunlight. . . In keeping with the rest of the poems in the collection, “The dream and the dream you spoke” transforms the way we perceive the ordinary world around us through stunningly original imagery and language. Taken singly and together, these poems ultimately reveal places as ordinary as Watervliet, New York, or experiences as common as reading a poem, to be extraordinary and enchanting. Christina Cook is a poet and translator and her work has appeared or is forthcoming in a number of journals including, most recently, Prairie Schooner, Hayden’s Ferry Review, Poetry Salzburg Review, and Sojourn: A Journal of the Arts. Her manuscript, Out of the Blue, was shortlisted for the 2006 Dorset Prize, and she was a finalist for the 2007 Willis Barnestone Translation Prize. Christina holds an MFA from Vermont College and an MA in English and American Literature from the University of Cincinnati. She is a poetry editor for Inertia Magazine.